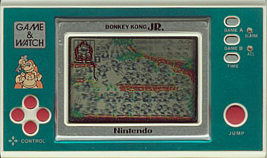 Mario has captured Donkey Kong, and it's up to his son, Donkey Kong Jr., to run through the jungle, collect Mario's keys and free his father. DK Jr. has to dodge Snapjaws by jumping and grabbing the vines as he moves up the stage. Once he reaches the top, time his jump to grab the key swinging on the vine. The level will then restart with part of Donkey Kong's cage removed. Collect the key four times to free DK and receive a bonus score.